As wildfire season approaches, crews around the state are working on projects to try and mitigate the risks associated with a big blaze. 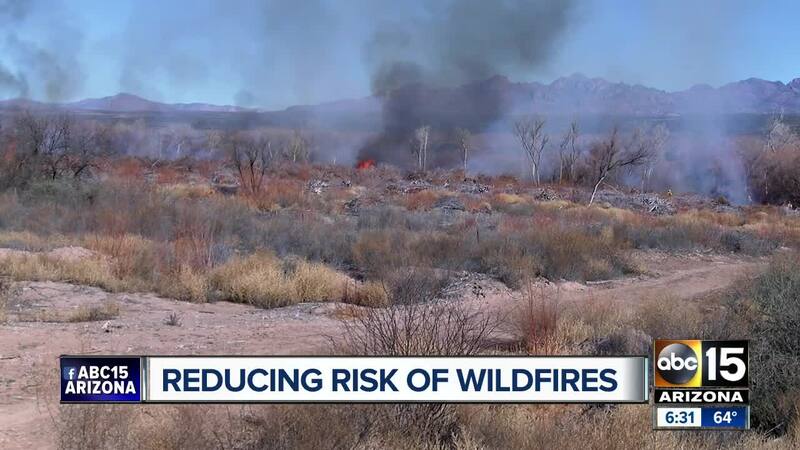 ABC15 tagged along during a prescribed burn near Safford with the Arizona Department of Forestry and Fire Management. The two-day burn spanned roughly 20-acres and saw crews burning piles of tamarisk, vegetation that can pose a big fire hazard. "This stuff loves fire," said Assistant Fire Manager Lehi Vizcaino. Vizcaino told ABC15 the project near Safford, just outside of Fort Thomas and along the Gila River corridor, comes with several benefits. "It's to eliminate that risk or that potential of fire and to be able to give us a place to work from if we do have a fire in the area," he said. Crews will also re-plant the area with some native species as part of the restoration project. Vizcaino says after they burn all the tamarisk piles, the open area will be plotted on a map for other emergency crews to refer to if a fire breaks out. "We have a lot of fires down in the river systems, not just in the Gila River but in other waterways," he said. "So it gives us a management point." Just back in January, the Dept. of Forestry and Fire Management credited the elimination of hazardous fuels, in part, as a reason why 2018 did not see nearly as severe of fires as a year prior. In 2017, fires burned roughly 420,000 acres, according to the state. "Shortly after our fire activity died down last summer, we jumped right back into project work to eliminate hazardous fuels around the state," said State Fire Management Officer John Truett in a January press release. "We also increased our prescribed burning projects, and have so far burned nearly 6,000 acres of debris piles. Fuels mitigation remains our top priority over the next few months leading up to the time of year we start to see heightened fire activity."